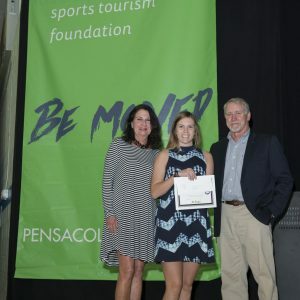 Each year, Pensacola Sports brings together the top senior student-athletes in each sport from Escambia and Santa Rosa County schools for a dinner and scholarship recognition program. 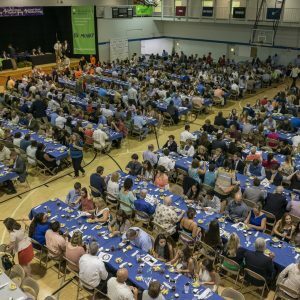 227 seniors, over 750 total people, were in attendance last year at Olive Baptist Church for the Annual Senior Scholar Athlete Banquet Presented by Sacred Heart Health System. Join us again as we celebrate a new class of seniors at the Annual Senior Scholar Athlete Awards Banquet. 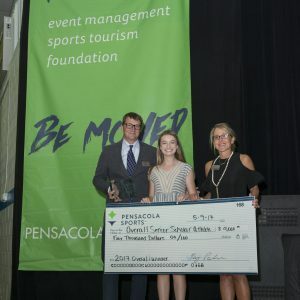 Stanley Dorion, Pensacola High School and Ellen Floyd, Pensacola Catholic, won the overall male and female scholarships, respectively. 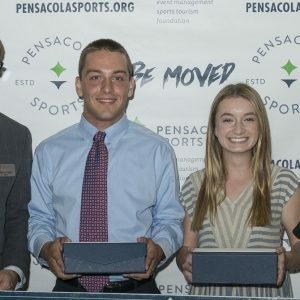 The Pensacola Sports Foundation awarded these two individuals each with a $4,000 scholarship. 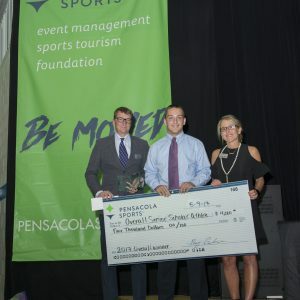 Other awardees were Luke Racine from Tate (University of West Florida Scholarship), Jordan Mann from Milton (Gary McAdams Memorial Scholarship), Heidi Vega from Pensacola High School and Matthew Blalock from Tate (Whataburger Books Scholarship), Mary Middleton from Pensacola Catholic (Dr. Alec Kessler Memorial Scholarship), Jacob Adler from Pensacola High School (Papa Jay Memorial Scholarship) . 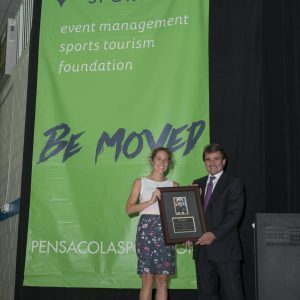 Additionally, Pensacola State College awarded 24 individual sport winners with a scholarship. 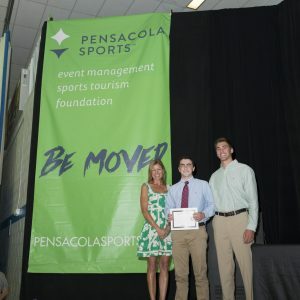 Schools in both Escambia and Santa Rosa nominate their senior athletes for each sport and submit the paperwork to Pensacola Sports. 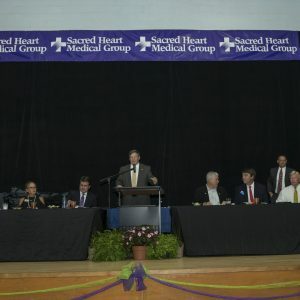 A selection committee made of educators, community leaders, and Pensacola Sports board members reviews the anonymous applications and select the best person’s credentials for each sport. Those are the individual sport winners. Then they select the overall male and female winners from the individual sport winners. 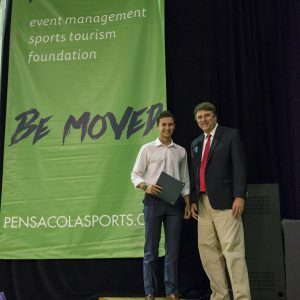 For more information on the Sr. Scholar Athlete Banquet, how to get involved, or to support next year’s event, contact Amy Marquez at Pensacola Sports at 850-434-2800. 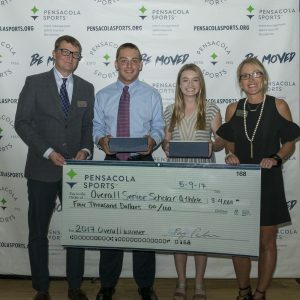 Pensacola Sports Senior Scholar 2017 May 9. 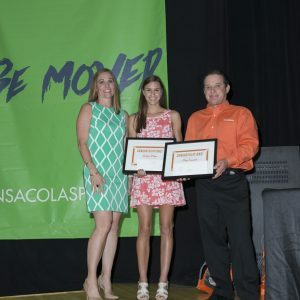 Tag your instagram photos #seniorscholarathlete to see your photos on our site!